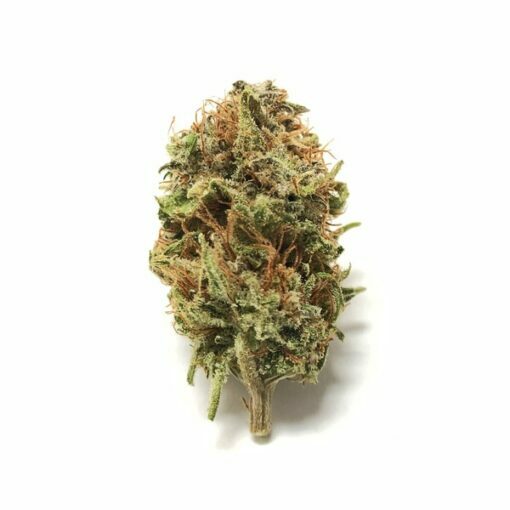 Pineapple Skunk Strain is an indica dominant hybrid (80% indica/20% sativa) strain created as a three-way cross of the delicious Pineapple x Skunk #1 X Cheese strains. Pineapple Skunk is infamous among medical patients for its flawless fusion of powerful pungent and sugary fruity flavors, with a cheesy pungent skunky taste that has a light and airy sweet fruity aftertaste. The aroma is very much the same, with a sweet fruity bouquet that quickly becomes pungent skunk as the nugs are broken apart. The Pineapple Skunk high has fast hard-hitting effects that are powered by a moderately high THC level that ranges on average between 15-19%. The high hits hard in both the head and body, leaving you uplifted and euphoric with a slowly building sense of introspection that can leave you spacey and distant at times. This head high is accompanied by a deep sense of sedation and couch-lock that will leave you utterly relaxed and completely at ease. Because of this potent combination of effects, Pineapple Skunk is said to be perfect for treating chronic stress, insomnia, nightmares, and chronic pain. These nugs have long lumpy spade-shaped light minty green nugs with dark furry amber hairs and a thick frosty coating of white crystal trichomes. Clouded in mystery, Pineapple Skunk’s genetic downline comes from a mad mixture of her three compelling strains, and creates a high that walks the tightrope between both strain’s medicinal effects. Humboldt Seeds is the OG Pineapple Skunk Strain creator, as such its origins are likely up in northern California. Working in synchronicity, the cannabinoids and terpenes from the three strains form a synergistic hybrid that helps ease your mental and physical pains. A pleasure to grow in the garden, she’ll flower quickly and easily, and provide high yields, too!